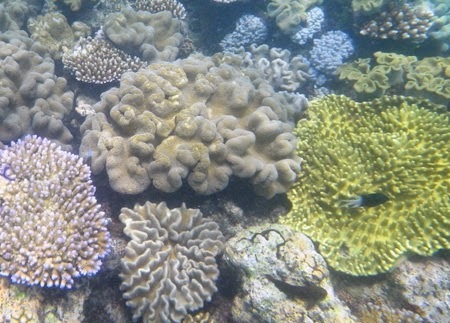 A view of a small section of the Great Barrier Reef from overhead. 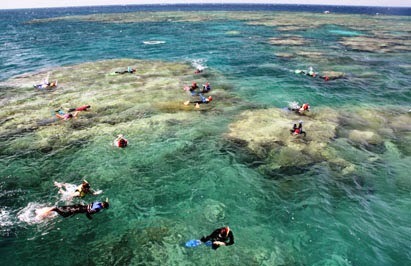 For the ultimate snorkeling (or diving) experience, you can’t beat the Great Barrier Reef. During our trip to Australia, we took a one-day excursion from Cairns, one of Australia’s most popular destinations, to experience this UNESCO World Heritage Site. 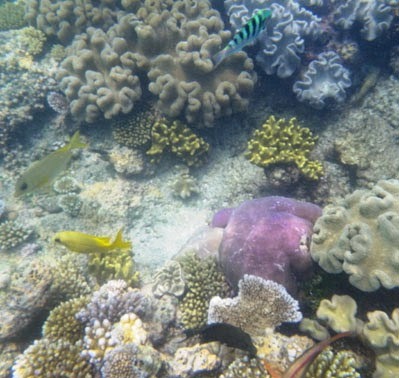 Plentiful fish and coral varieties inhabit the Great Barrier Reef. 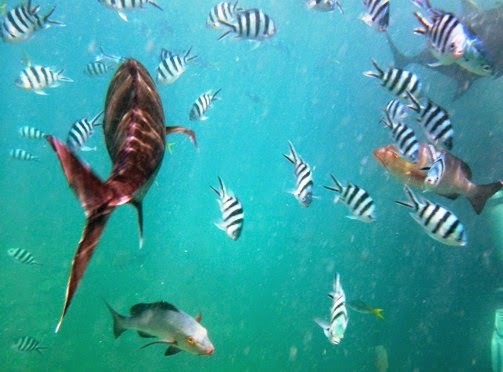 While the boat ride to the reef, which is actually comprised of more than 900 individual islands, can take more than an hour and may be a little rough, the experience of seeing multitudes of fish and coral in the ocean attracts more than a million visitors from all over the world each year. Coral takes many shapes and colors in this undersea fantasy world. Classified as the single largest living organism in the world, the Great Barrier Reef spans more than 2600 km from the Torres Strait in the North to the Fraser Island area in the South. Overall it covers an area larger than Italy. 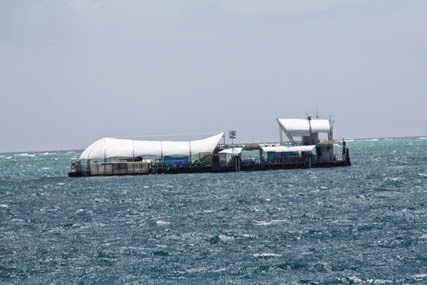 This underwater world is inhabited by more than 1500 species of tropical fish (10 percent of the world’s total fish species), 400 different types of coral, 200 species of birds, and 20 types of reptiles. 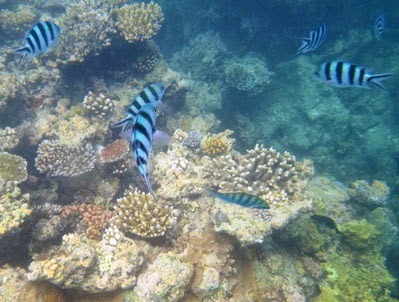 Fish swim in the clear water around the Great Barrier Reef. One of the “Seven Natural Wonders of the World,” the Great Barrier Reef is only about 500,000 years old, young by coral reef standards. Any visit to Australia must surely include this outstanding site. Just imagine: the Great Barrier Reef can even be seen from space. Nothing dark and dreary about this ocean world. Enjoy this small sample of photos Larry and I took while visiting this magnificent place. 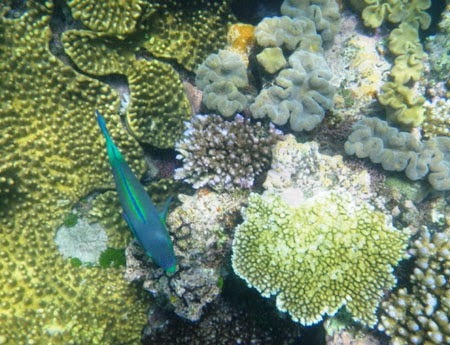 More colorful fish and coral at the Great Barrier Reef. The platform in the ocean where our boat docked for the day. 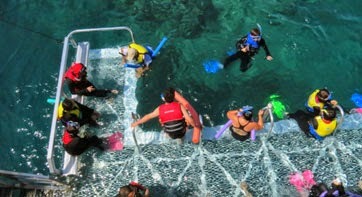 The snorkeling platform from which we entered the water. This place is near the top of my bucket list (just under Santorini) and your pics are making me want to go there more than ever! It's truly a special place. Don't miss it, especially if you enjoy snorkeling or diving.